Standing 5ft 6in tall and weighing 23 lbs., this economical, life-size articulated adult plastic model is the first quality numbered skeleton model. 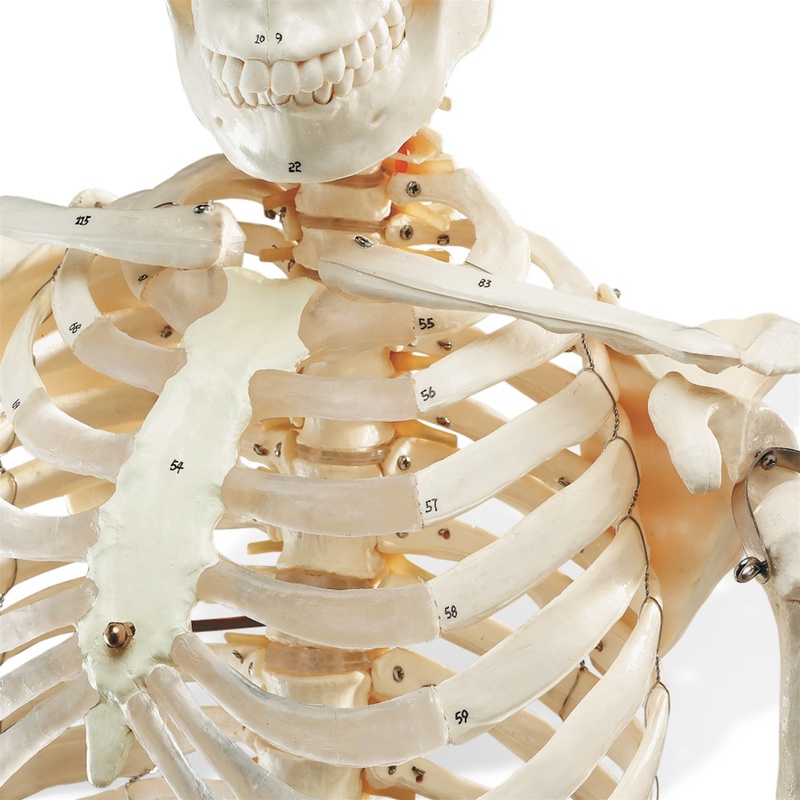 Amongst the numbered skeleton model, this is the most popular school-level skeleton. It is perfect for teaching the fundamentals of skeletal anatomy and this includes 200 numbered skeletal parts for proper and better identification of various bones. And for further examination, the joints are articulated which allows it to move. Aside from that, the arms and the legs of the skeleton are both removable for in depth study. • vertebral artery and herniated lumbar disc. This Numbered Budget Bucky Skeleton Model is very easy and comfortable to use because it comes with a rolling stand which also allows you to easily maneuver and move the skeleton model around. And for reference, this also comes with a comprehensive keycard. ECONOMY-This is called budget skeleton because it is very affordable and perfect for teaching the basic of the skeletal anatomy. It is very popular for school level education. LIFE-SIZE- It stands 5 feet and 6 inches tall giving you a realistic life-size view which is perfect and huge enough for a large group presentation. COMES WITH A ROLLING STAND-It is mounted on a rolling stand which allows the skeleton to stand alone during the presentation. Aside from that, this rolling stand also allows the user to easily maneuver and move the skeleton around. FUNCTIONAL- It features all the fundamental functions of the human skeleton. It has an articulated joint, three removable teeth, arms, and legs which is very helpful for a depth examination. NUMBERED- This includes 200 numbered skeletal parts for proper and better identification of the various bones. KEYCARD INCLUDED- It also includes a comprehensive keycard for reference purposes.